Headlines: The Lakes have been producing some very good fishing with all methods over the past two weeks. Polaroiding in Jindabyne has been on the improve and with more good weather this will continue for weeks to come. 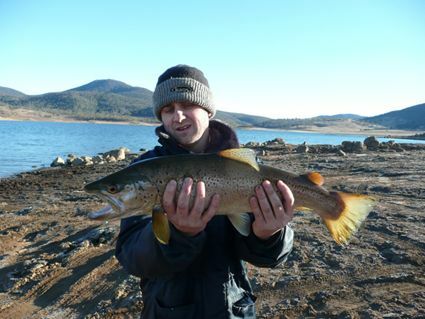 Bait fishing has been excellent in Jindabyne and good in Eucumbene, with both dams producing nice fish on the troll too. Boat launching in Eucumbene is available at Old Adaminaby, The Dam Wall and Buckenderra. Lake Eucumbene:- Fly reports have been good with some quality Rainbows showing up in the the Anglers reach area. Late afternoon searching with Woolly Buggers and Tom Jones Beadheads has produced the goods. Evenenings have been good too with Lumos and Craigs. The River end of the lake fired on the weekend with some great Rainbows being taken. *Stephen Dunn had a good session landing two Rainbows to 1.7kg on Woolly Buggers in the Anglers Reach area this week. He commented that they were very fat fish. *Another report of four anglers catching fifteen or so fish reached the shop this week too but no other details are available. Best areas to look at are Dam Wall, Collingwood, Coppermine and Old Adaminaby. Lake Jindabyne:- Jindabyne has turned some great polaroiding. There have been both Browns and pre spwan Rainbows in many areas. The Eastern shore early in the day and the Western shore in the early to late afternoon are the best options. If you have a boat that will give you more shoreline access. Don't despair if you are only on foot, as with a little persistence, you can still find fish. *Peter from Canberra fished the lake yesterday and though he didn't hook any saw a heap of fish. He had a couple of refusals and missed a take from a big Brown. He said there were pods of Rainbows cruising but they were difficult to tempt to eat a fly. Lake Tantangara :- No reports on fly but the lake has continued to rise this week and will be a good option this week, weather permitting. Be aware that access in a 2wd vehicle (and for that matter even a 4wd if it snows) can be difficult after snow and rain on the road. Eucumbene:- Trolling reports have been good with some really quality fish. Big Rainbows are the main target at present both getting deep and on flatlines depending on the conditions. Working deeper open water will find some quality fish. Covering as much country as possible with a good array of different depth lures, fished at a good speed, should find a few fish. The Rainbows have been on Daphnia, so greenish and yellow wing lures are good options. Fish have been sounded at 30ft as a regular occurance this week, so fishing deep as well as shallow is a good idea. The good old Yellow wing (#36) and Y48 Tassie have been great colours of late in Eucumbene. The Snowy Minnow, while more commonly used as a spinning lure has worked on the troll this weeks too. RMG Scorpions colour R32 is a great newish colour, that looks alot like a Crucian Carp. These would do well around the edges of the main basin, with reports of numbers of these small forage fish in numbers in close. Ultra deep Merlins are another good diving lure that get down to a considerable depth and are great fish takers. Browns love them. *Gary Smith from Canberra trolled the lake yesterday for three hook ups landing a 30cm Rainbow and a 40cm Brown. Both were released and were in excellent condition. 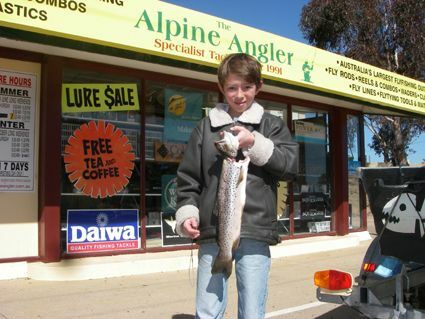 Jindabyne:- Excellent reports have come in from Jindabyne recently. *Tiziano Ossato and Egidio Ossato had a great couple of sessions landing 10 fish in total. Trolling Tassie devil #26 they caught a supurb 3.2kg Brown and what a quality fish it is. There other best fish were 2.5kg and 2kg Browns, 1/2kg Brook Trout and a 1.2kg Rainbow. 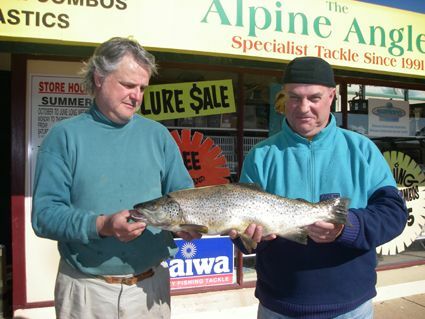 They even managed an Atlantic Salmon to complete the Jindabyne Grand Slam. What a top weekend! 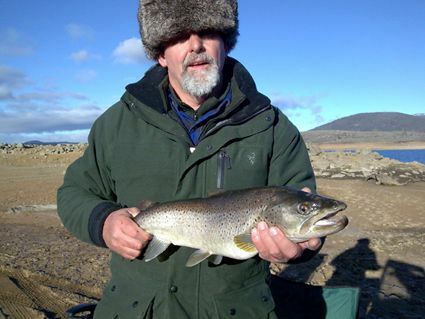 *Nick Hains from Canberra trolled up this fine Brown on a flat lined #48 tassie recently. Well done Nick. *Marty Harris caught this very nice 58cm fish on a Rainbow Trout Squidgy right on dark. Nice fish to spin up from the shore. He also managed one pre spawn Rainbow on bait too. 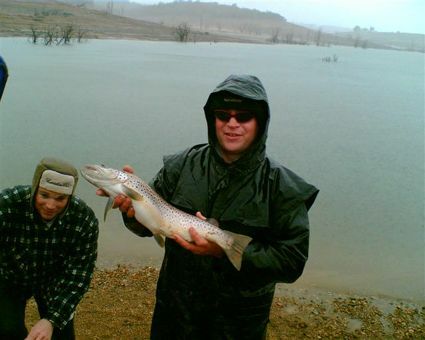 Baitfishing :- Bait fishing has been excellent in Jindabyne with Scrub worms on the bottom taking some nice Browns. Grubs (if you can get them) will also produce. Some good numbers and also sizes have been taken. *Hi all, Fished Jindy, Friday night , Kalkite area, the only thing to rattle the bells was the wind !!!!!,clearing,finally! 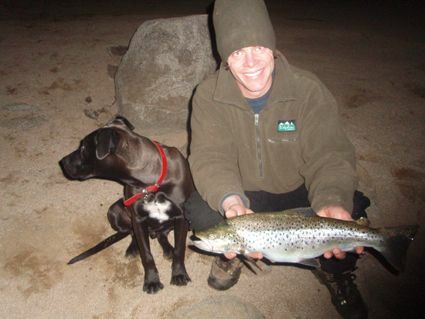 after snow showers, to a clear bright night, no fish were caught during the night. (cold cold cold). We were welcomed to clear skies and still conditions saturday morning,great conditions for fishing, catching two browns going near 5lb and 6lb,caught on Chunky Cheese Powerbait,no luck with other powerbaits and grubs. There have been a few Browns that have already spawned turning up in Eucumbene so these fish will be very hungry as they try to pu on some condition after running the river. A good time to be soaking a bait in the Anglers Reach/Old Adaminaby area. Up to Old Adaminaby for the day Saturday 10th August nice 1.8kg Brown on wood grub not much of a fight at first then I think he relised he was hooked then off he went, Also a couple small rainbows a great day had will be back soon so fish look out! In Jindabyne try Creel Bay Waste Point and Stinky Bay.